Now this is super-freakin’ cool, and I’ve been meaning to blog about it for a while. 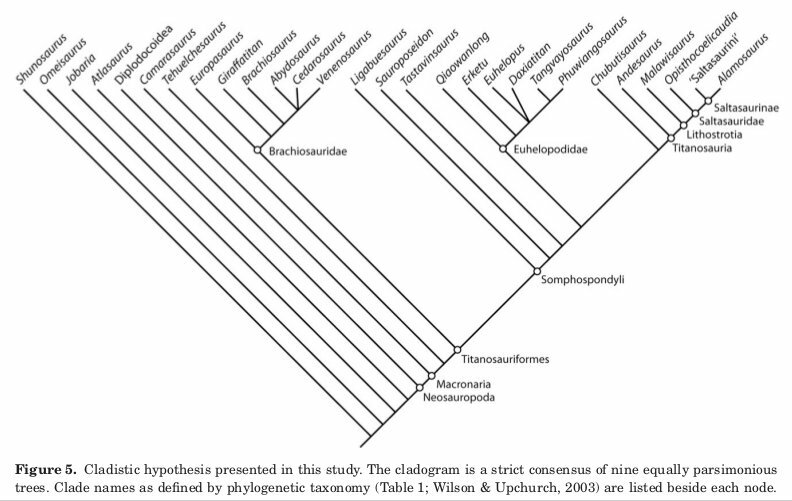 In Mike D’Emic’s recent titanosauriform phylogeny (D’Emic 2012), he (correctly) included Brachiosaurus and Giraffatitan as separate OTUs, and, hey, whaddayaknow, they’re not sister taxa anymore: Brachiosaurus is more closely related to a trio of Early Cretaceous North American brachiosaurids than it is to Giraffatitan. The potential for someone to find this result was there ever since Mike broke Brachiosaurus and Giraffatitan apart, as a previously composite OTU, in his 2009 paper. It just hadn’t materialized. In fact, some authors have gone out of their way to not find this out, by keeping the old composite coding. That seems…unwise, in retrospect. Whether one agreed with Mike on the nomenclatural point of generic separation or not, not coding the two taxa as separate OTUs (especially after Mike had done that work for them) was a poor phylogenetic decision–in essence, it constrained Brachiosaurus and Giraffatitan to be sister taxa in the analysis, and outlawed any more interesting results–like the one obtained by D’Emic (2012)–before the software even started crunching trees. So anyway, back to the coolness inherent in D’Emic’s tree. Of course, like all phylogenetic results this is just a hypothesis and it is subject to revision based on new information blah blah blah…but it is really interesting that there is now some phylogenetic support for an endemic radiation of brachiosaurids in North America (bonus goofy observation–you can’t spell ‘endemic’ without D’Emic). Or perhaps Lauriasia–I would kill to know where the British brachiosaurids (or basal titanosauriforms) fit into this story, and Lusotitan, and the apparently tiny Croatian carbonate platform brachiosaurs. Also super-interesting that, if this tree is accurate, these endemic Early Cretaceous brachiosaurids were living alongside a giant basal somphospondyl in the form of Sauroposeidon, which came from heaven knows where. Look who it’s surrounded by–Ligabuesaurus is from Argentina, Tastavinsaurus is from Spain, and the euhelopodids are from eastern Asia. Evidently there was also a global radiation of basal somphospondyls. And why are all the Early Cretaceous North American brachiosaurids small–smaller than Brachiosaurus and Giraffatitan, anyway (at least until we find bigger individuals of the former)–while Sauroposeidon is so big? Or is that just an effect of tiny sample sizes, and one lucky strike in the form of the Sauroposeidon holotype? So much cool stuff to think about. I don’t usually get this much enjoyment out of a tree unless it has lights and ornaments. Taylor, M.P. 2009. A re-evaluation of Brachiosaurus altithorax Riggs 1903 (Dinosauria, Sauropoda) and its generic separation from Giraffatitan brancai (Janensch 1914). Journal of Vertebrate Paleontology 29(3): 787-806. Now, alternately, this is why species-based OTUs should be used, OVER any supraspecfic taxa that might be preferred, even if you LIKE “genera” — whatever the heck those are. A recent cladistic analysis I ran on another clade of animals had to deal with this very issue, segregating conventionally-combined taxa versus splitting them, and testing the composition by assessing how much cajoolery in the results is required to get a certain result: how many steps recover topology A versus B, how many characters support per optimization to test for homoplasy, etc. Imagine, for example, that one of these taxa were more “basal” because it’s more plesiomorphic relative to another taxon but they’re sister taxa. Jaime, I agree that the less lumping-of-specimens-into-OTUs, the better. Even species are suspect in the paleo realm. I don’t think they are any less subjective than genera (at least for sauropods), and they might be more subjective. For example, everyone pretty much knows what Camarasaurus is, but I’d have go look up what characters separate C. lentus, C. grandis, C. supremus, and C. lewisi. Do those characters really separate species, and not populations or regional variants or whatever? Beats me. But we can all tell Camarasaurus apart from Haplocanthosaurus, Bellusaurus, etc. Back in 1997, Brian Curtice once told me that for sauropods, species names are basically quarry markers. Nothing I’ve seen in the subsequent 16 years has seriously threatened that assessment. AFAIK, the only specimen-level phylogenetic analysis published for sauropods is that by Upchurch et al. (2004) for Apatosaurus. Does anyone know of any others–if not for sauropods, then for other Mesozoic dinosaurs? Basically, whenever we put a name on a non-monotypic fossil specimen — be it genus or species name — we are encoding a phylogenetic hypothesis in our nomenclature. That makes me queasy. In fact, I wish D’Emic’s analysis had coded “Sauroposeidon Classic” (Matt’s specimen) separately from what used to be Paluxysaurus, so that the tree could confirm or deny his assumption that they are the same thing. Had they popped up in non-sister position, that would have thrown a spanner in the works of his synonymy, but the way the analysis was coded there was no way that interesting result could be recovered. I think Adam Yates coded Plateosaurus specimens as separate OTUs. That’s one thing I had wished he’d done too. In D’Emic’s paper that synonymizes Sauroposeidon and Paluxysaurus (D’Emic and Foreman, 2012) the only overlapping remains between the Cloverly sauropod fossils and the holotype of Sauroposeidon is a single juvenile cervical (YPM 5294). Additionally, it is difficult to tell if the cervical even belongs to the same species as the other material in the bonebed, as the bonebed contains the remains of at least three individual sauropods, as well as turtle, crocodilian, ornithopod, and other fossil material. The original description of Paluxysaurus included cervical vertebrae, but unusually the author did not compare them to Sauroposeidon. Coding the specimens separately would probably make them fall out in the topology in different positions, especially if the respective specimens score for traits along different sections of the body and particularly at different levels of completeness – I don’t feel such a result (if revealed) shows anything major, except hinting at different rates of character transformation along different parts of the body. Note that while the Cloverly material and the Sauroposeidon type have little overlap, there is relatively more overlap between the Paluxysaurus and the Sauroposeidon types, and also between the Paluxysaurus type and the Cloverly material. Two separate and interesting issues here: one, the referral of all the different specimens to Sauroposeidon, and second, the scoring of them all together as Sauroposeidon in the analysis. On the referral point, I agree that the Paluxysaurus material is the Rosetta Stone here, since it has relatively complete and undistorted cervicals from an adult or near-adult that can be directly compared to the holotype, and parts from the rest of the skeleton that can be compared to the Cloverly material. For that reason, and because IMHO it’s just the Thing To Do when sinking a taxon, I was hoping for a point-by-point comparison of the Paluxysaurus material and the Sauroposeidon holotype, but that hasn’t happened. Which is odd. It leaves me in the uncomfortable position of agreeing with the proposed synonymy, but disapproving of the method in which it was carried out. On the coding point, I personally see nothing to be gained by throwing OMNH 53062 into an analysis by itself, because I already know what will happen: it will blow apart all of Somphospondyli into a massive polytomy, if not all of Titanosauriformes or even Neosauropoda. That’s what fantastically incomplete specimens do. Hell, that’s what Brontomerus did in the strict consensus, and there we had a LOT more character data from the referred material. But I can see putting in the Paluxysaurus and Cloverly material separately. Maybe. It still seems fake–if all you do is code up the presumed autapomorphies of Sauroposeidon as present in those two specimens and absent in everything else, and as long as there are no conflicting data to pull them apart, the result is sort of a foregone conclusion. I think it’s only interesting if there is conflicting data, by which I mean at least one of the specimens sharing a character with something outside Sauroposeidon, but not with the other specimen, or some of the supposed autapomorphies of Sauroposeidon turning up in other taxa, or both. But I’m happy to be proven wrong. In this case, there might be conflicting data, in that there are other Sauroposeidon-esque taxa in the Early Cretaceous–things like “Angloposeidon”, and possibly the Long Walk Quarry sauropod and the undescribed CEU brachiosaur–but they are all either too incomplete to be worth including, or not yet published and therefore off-limits. As always, we need more data. Ah, the spirit of science! Well, it’s a good point, about Sauroposeidon. I don’t know of anyone who didn’t go through a phase of thinking that a computer algorithm was God, or at least, a reason to stop thinking and start shoveling the data in, on the assumption that the answer would automatically popped out if enough of the right data went in. IIRC, Paul Upchurch and some colleagues are working on Lusotitan. So we can be confident that when the paper arrives, it’ll be done well. Has SVPoW addressed D’Emic’s arguments that Xenoposeidon is not valid? Is there some sort of shared character matrix data (a wiki?) so people can add more OTUs and characters without having to repeat all the work (and without omitting specimens they don’t have access to)? It sounds like rerunning the analyses is easy, deciding how to run them is a little tricky, and getting enough characters is really hard. Not yet. And it’s not just Xeno–he argues that Brontomerus is a nomen dubium as well. Obviously, we disagree. But for this post, I wanted to stay on the interesting results from his phylogenetic analysis, and not get into those issues. Also, for my part at least, I haven’t decided how best to respond. This feels like something that might better be addressed in a formal publication, and if so, I might want to keep my powder dry and not blab about it on the blog beforehand. I haven’t made a firm decision on either of those points, mostly because I have a lot of other things on my plate right now. But I’m sure we’ll get there sooner or later. It sounds like rerunning the analyses is easy, deciding how to run them is a little tricky, and getting enough characters is really hard. I agree with all of that. And I don’t know if there is a wiki or not, but it sounds like just the ticket. I suspect not, but there are some big collaborative groups, like the theropod working group and the various Tree of Life groups, and maybe they use something like that. Maybe someone who knows more will chime in? Yes, it’s looking increasingly ridiculous as time goes on that half a dozen different sauropod workers are all maintaining their own matrices. I discussed this once with Paul Upchurch. It was a few years ago now, and I don’t remember the conversation in detail, but I seem to remember he liked the sense that independent streams of work gave us an opportunity to studies to corroborate and contradict one another. There’s something in that: if there was just one Grant Unified Sauropod Matrix which we all added to used subsets of, there would be a tendency for people to treat its results as definitive rather than the hypothesis that they would really be. Whereas all through the early 2000s, everyone knew from contradictions between Paul’s results and Jeff Wilson’s that, for example, the base of Neosauropod was unstable and the position of Euhelopus was up in the air. Still and all, I would be prepared to sacrifice that (and make up for it with careful education) in exchange for the many benefits of a Grand Unified Matrix. Actually, I’d welcome people’s thoughts on how we should address Mike D’Emic’s drive-bys on Xenoposeidon and Brontomerus. I don’t think we can just ignore these parts of his paper, due to the distressing tendency of the world at large to treat whatever statement was published last as Correct. But what level of formality is appropriate in responding? SV-POW! posts? arXiv deposits? PeerJ papers? Something else? I’ve made some — I think effective — arguments in response to particular papers, but they are even informally not really discussed. Mike and I have a back-and-forth complement between our blogs, but there’s not much of that beyond us. Once I start establishing myself publication-wise, I might start considering a “reanalysis” or limited-perspective, disagreement-based short piece in a more formal venue, even perhaps using arXiv, though I’d much rather like a “formal” venue. I’d love, for example, to take a review on the potential oviraptorosaurian material from Europe, given that as Darren notes it seems odd that oviraptorosaurs are so far not confirmed from the continent despite the presence of many similar, related taxa (I think there’s a reason for it, but a blog post seems unworthy of this hypothesis). I think Matt and Mike should try for a short piece, and aim for PLoS or PeerJ, that addresses THAT specific topic. I would do the same for my own ideas. I don’t know of anyone who didn’t go through a phase of thinking that a computer algorithm was God, or at least, a reason to stop thinking and start shoveling the data in, on the assumption that the answer would automatically popped out if enough of the right data went in. Well, if enough of the right data go in, you will get a good answer. The trick is figuring out when these conditions are met. It’s pretty much only possible in hindsight. I would recommend a formal peer-reviewed venue; you may discuss it initially on the blog or arXiv, but it would be most helpful in the end to put it out there in the peer-reviewed literature where it can be more easily cited (and where folks are less likely to dismiss it). Jaime and Andy, thanks for your thoughts. You’ve pretty much convinced me. Ultimately for me it comes down to this: there’s no point in making the argument that Xeno or Brontomerus is not a nomen dubium unless one intends that rehabilitation to be a taxonomic act. And for that reason alone, I want it published in a proper journal, where it will have some heft, and I don’t want to muddy the waters by having multiple versions floating around. Matt: “I don’t want to muddy the waters by having multiple versions floating around.” Do you mean by this that you don’t want our response to appear on SV-POW!, or indeed arXiv or PeerJ preprints, before the peer-reviewed version appears?